Seeing as I'm almost done with a pair of socks -- and I'm over the halfway point with my Garland Shawl -- I decided it was time to cast on something new. This is the Ericka Scarf from Sock Yarn One-Skein Wonders, a book I just happen to own. It's an easy 2-row pattern -- perfect for traveling. 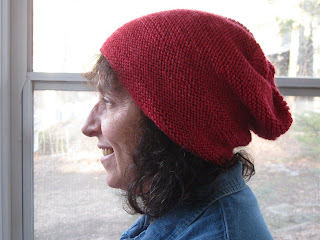 I chose this pattern because it's portable and it can be done on circular needles. In a couple weeks I'll be heading for Spain, and I don't want TSA to take away my knitting! 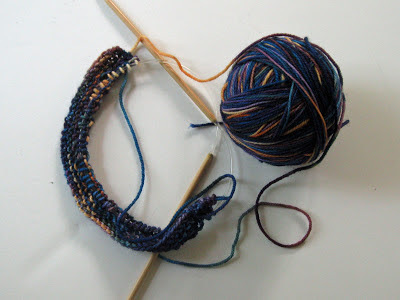 The yarn, which is so yummy, is Manos Del Uruguay Alegria. It was an impulse buy at a LYS. I hope it doesn't pool, but the colors are so beautiful that I'm not sure pooling would ruin it! Any guesses on what this is going to be? It won't be used as a flat picture. I am not going to share my sketch from yesterday. 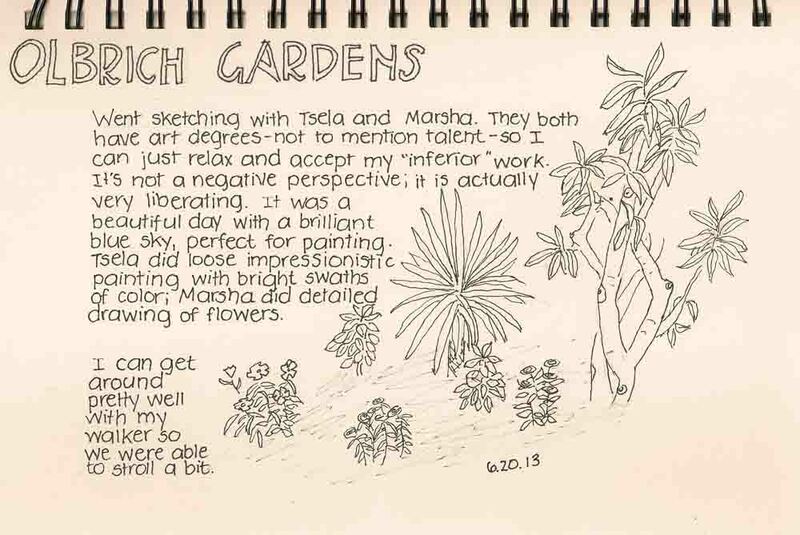 I went out sketching with Marsha and Tsela again, and my drawing was absolutely awful! In the future, though, I should try to get copies of their pictures. They are both really talented. I started the decrease half of my Garland Shawl. I'm looking forward to having it go faster as the rows get shorter! But what is a monogamous knitter to do? I've been knitting steadily on my Garland Shawl, and today I hit the halfway point! 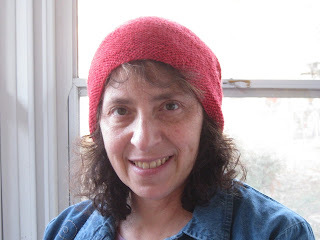 Monogamous knitting is not typical of me -- and I think that blogging is part of the reason. Really. Who wants to see the same project over and over, with just a few more inches each time? 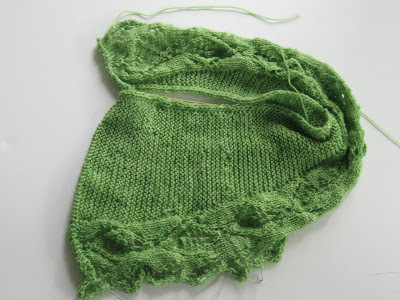 I could probably be 75% of the way done if I haven't had to frog and re-knit so much. I don't know why I've been making so many mistakes. I can't blame the designer as the pattern is very clear. I guess it's just my ADD brain. Is it my imagination: The garter section looks ragged. Hopefully it will all block out! I've finally gotten on board with Tami Amis's Work-In-Progress Wednesdays. You can join in the fun here. Don't those colors just pop? I love the way the whole piece came together. These are not "my" colors. 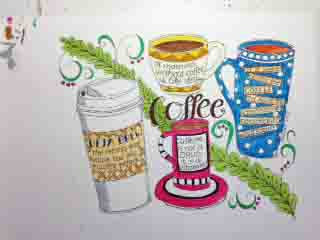 I tend to stay with the traditional jewel colors, which is a mistake. Working with a different palette is fun. It's also got to be a good business decision. It's not like the whole world shares my taste! This piece was inspired by the beautiful glass disk beads I found on Etsy. They are handmade by Patty Miller of CabariBeads. She does beautiful work in metal as well as glass. I'm quite sure I'll be ordering more from her! BTW, the piece will be up in my Etsy store later today. Just saying. My Garland Shawl is coming along beautifully. 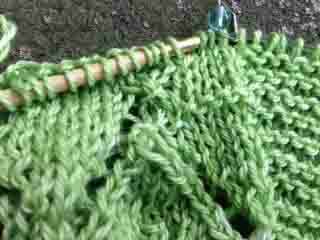 I'm on the eighth repeat for the edging, out of (I think) 19 total. 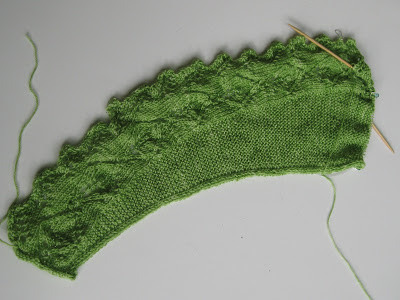 The border seemed hard the first time I worked through it, but it turned out to be fairly easy -- I'd recommend this pattern to a fairly new lace knitter. 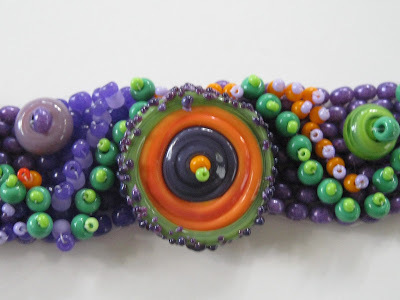 The beads do slow things down -- but I think they are totally worth it. 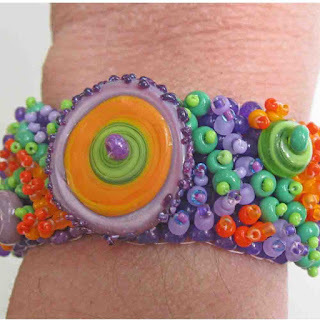 The shawl's designer, Michelle, has come up with a perfect way to contain and use beads using an Altoids-type tin. You can see it here. But if you decided to knit it without beads, it would go very quickly. I've mostly knit this sitting on our front porch -- my main way of getting outdoors. However, I am walking a little more each day. As I've said before, I do not recommend breaking your leg. It is nowhere near as fun as you might think! We had a great time, just talking and drawing and painting, and we agreed we need to do this agai. I'm going to hold them to that! It's a 2x2 ribbed sock for a man (one of my brothers in this case). This is definitely a labor of love because it is SO boring. Fortunately, it is the 2nd sock, so I know that I will finish it. 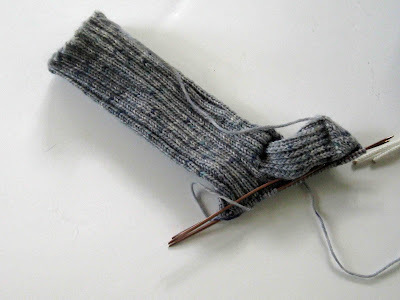 But then, I have to get to work on a pair for my other brother! 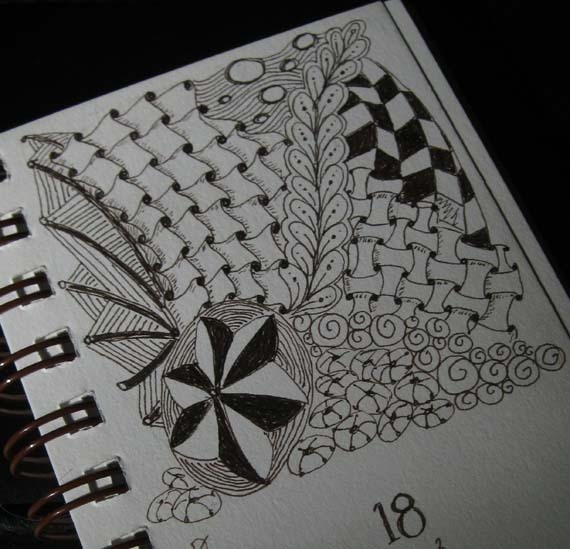 Working with a free-form, as-you-go pattern is quite meditative, although it does take concentration. I'm enjoying the color combination of purple, lime green and orange. The fabulous focal disk beads are from Etsy seller CabariBeads. I love finding components on Etsy and buying from Etsy sellers. It has a great community feeling to it. Here it is: the first Monday of summer vacation. And it feels ... odd. I forget from year to year that it takes a good week to switch to a vacation mood. It still seems like there must be children at school waiting for me! The weather yesterday was beautiful -- warm, blue sky, not too humid -- so I spent a chunk of time sitting on the front porch and working on my Garland Shawl. Apparently I was a little too relaxed because I knit a few stitches of garter stitch into a stockinette section. Can you see it? I'll have to go back and rework those stitches. Note: I tried to circle the mistake in Photoshop Elements, which I was able to do. However, Blogger wasn't able to upload the altered photo. I wish they'd come up with a Photoshop Elements for Dummies program. I know I don't thank my readers often enough for their comments, so let me do that. You guys are awesome. And you help me so much. For example, Alicia of Woolen Diversions pointed out that I should provide the link when I mention my Etsy store. Duh! How did I fail to think of that? At any rate, my Etsy store is right here. Yesterday was my first full day of summer vacation -- and I spent most of the day doing creative stuff and listening to NPR, except for an hour visit from my friend Debbie. I still can't drive, so I'm always happy when someone stops by! I started out the day by doing this Zentangle. 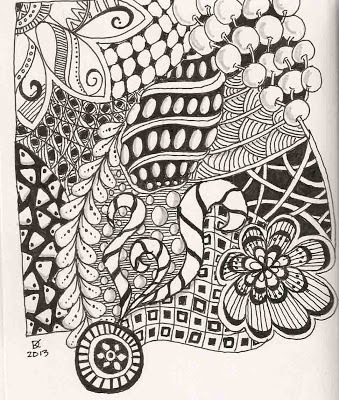 I can't explain how much I love this Zentangle stuff. It is relaxing and meditative, as it is supposed to be. But it is also a great artistic tool. I've explored pattern and texture and shading and tones -- and probably other things that I've picked up subconsciously. As nice as yesterday was, I really need to get going on how to get sales on my Etsy site. I am awful at self-promotion, so this is quite a challenge for me! I am just in love with the Garland Shawl, which I'm knitting as part of a KAL. The construction is so clever. The shawl is knit from end to end, with three sections that run the full length: an i-cord edging, a garter stitch section, and the leafy garland border. This isn't the best picture because I had to use a flash. I'll get a better one when it stops raining here! Today we had the Farewell Celebration for our 8th-graders. I'm tired, but in a good way. This was a great group of kids -- really, the best ever -- and I am sad that my time with them has come to an end. My broken leg kept me from participating in the more crowded events of the day, but I made sure I could participate in the ceremony and the reception for the parents. Teaching can be so hard; many days leave me feeling like I'm not helping anyone. But to receive so many hugs and thank-you's makes it all seem worthwhile. 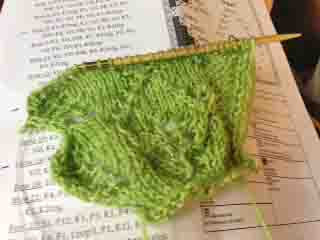 My Spring Green skein from Knitted Wit arrived Saturday, just in time for the Monday cast-on for KAL of Michelle's Garland Shawl. Michelle designed the Zen Rain Shawlette, which is one of my most-worn shawlettes. It's pretty and versatile and just plain easy to wear. Garland looks like it has all of those same qualities -- plus, it has an intriguing architecture: You knit it from end to end, the long way. 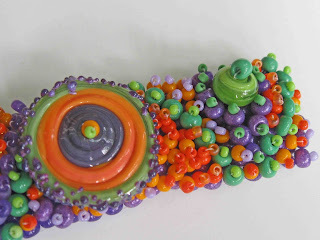 It also incorporates beads -- something I've wanted to add to my knitting for a while. There are two versions of the shawl; I'm going for wide and shallow. 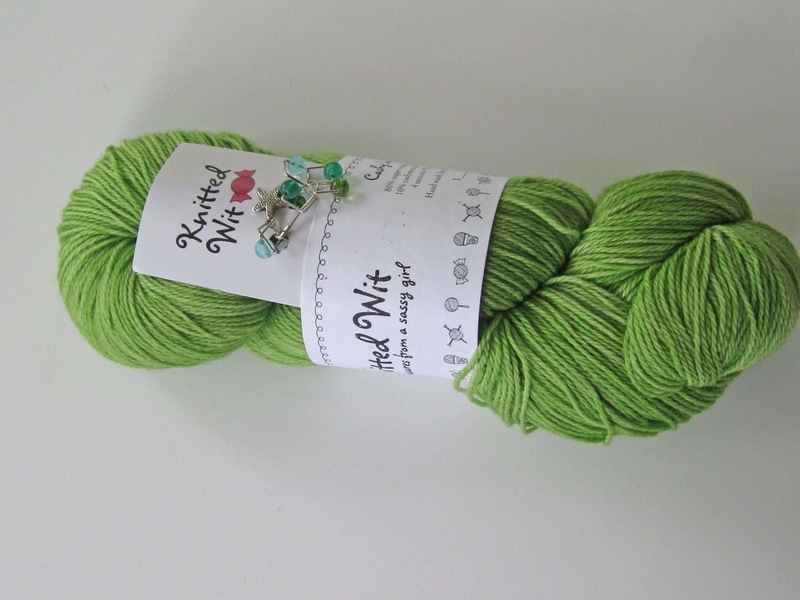 I ordered this colorway of Lorajean's Cashy Lite (80/10/10 Merino/Cashmere/Nylon, 495 yards). It's my first taste of Knitted Wit yarn and I have to tell you that it is smooshy! It's not too late to join us. Believe it or not, this is the first KAL I've ever done. Michelle writes great patterns. Dive into your stash or hit the yarn store tomorrow -- and cast on with me! I love this pattern. It's a free pattern from Happy Knits and you can find it here. The pattern calls for Madelinetosh Tosh Merino DK. Its simplicity makes it perfect for showing off a beautiful yarn -- and I have maintained my love of MadTosh over the years. I love the way the hat slouches. I made one as a gift, but this one's for me. The theme of the June issue of Smithsonian Magazine is food, but the cover featured knitted, not real, morsels. It's nice to come across knitting in unexpected places, don't you think? And by the way, there are some good articles inside! 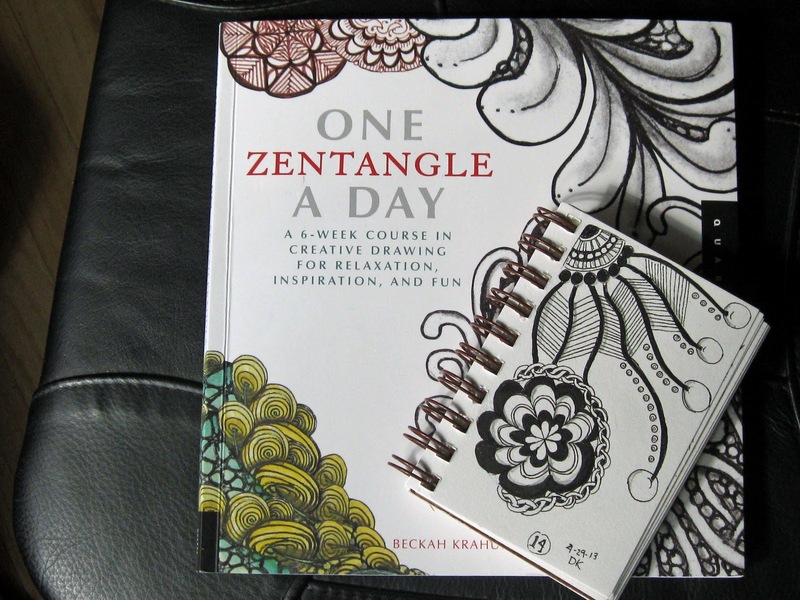 I haven't written about Zentangling for a while, and I think this is a good time for it. 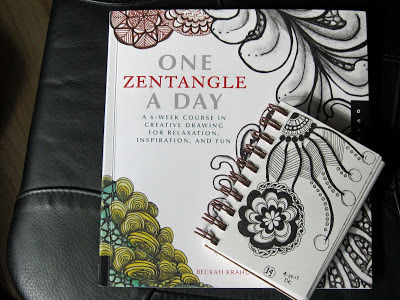 I am slowly working my way through One Zentangle a Day, and it is helping me in two ways. 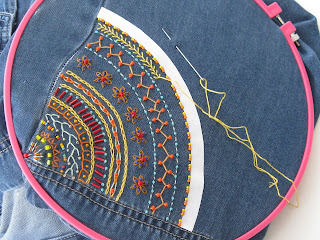 First, it is expanding my repertoire of patterns and ways to use patterns. Equally important, it really does have a Zen effect on me. There have been lots of stressful days with my broken leg, and Zentangling has always helped calm me. 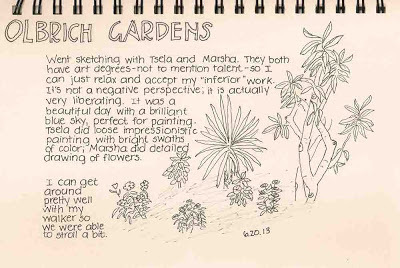 I'm not very good at traditional meditation, but I drawing in this structured way is calming. And I am going to need some Zen to get through the last two weeks of school. Working my full schedule with a broken leg has been more tiring than I expected, but I'm determined to stick it out! 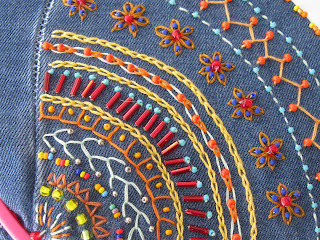 Last summer I was on an embroidery tear. I just couldn't stop! Some of you may remember that I started buying denim clothing at thrift shops. The used quality of the clothes freed me up to play around and make mistakes. Recently, I pulled out a Tencel jacket that I'd picked up at Goodwill and decided to incorporate more beads on this garment. I really like the way it's turning out. However, I slipped it on and learned the hard way that Tencel is not as strong as denim: I'm worried that the embroidered parts are too heavy! 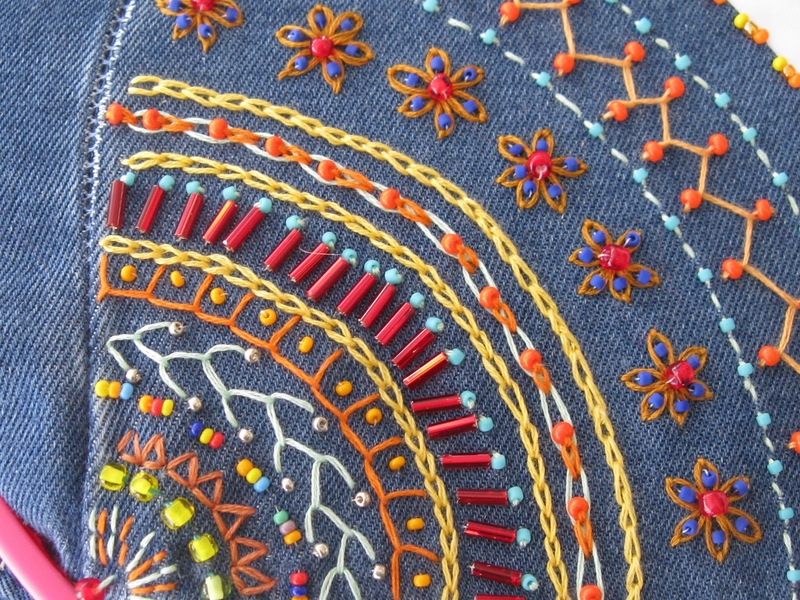 I think I'll finish with just thread and see if I have to take out some of the beads.